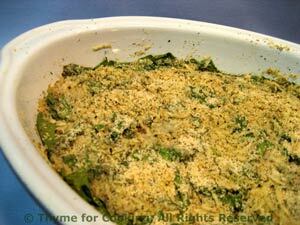 Simple Spinach Gratin, Thyme for Cooking side dishes. Fresh spinach cooks quickly, with a bit of stock to keep it moist. It's topped with a seasoned mix of bread crumbs and shredded cheese for a quick, healthy side dish. Remove thick stems from spinach and roughly chop: pile the leaves up and cut through 2 or 3 times. Put spinach in oiled baking dish just large enough to hold it. I used my 8 X 11 inch (20 X 27.5cm) oval ceramic dish. Heat stock and pour stock over spinach. Mix bread crumbs, thyme and cheese and sprinkle over spinach. Cover with foil and bake at 375F (190C) for 30 minutes. Uncover for last few minutes to brown top. Serve from baking dish. Note: I could barely get all the spinach in my dish; I had to press it down. Heating the stock helped wilt it so that it wasn't higher than the sides of the baking dish. As it bakes, it collapses, and the gratin topping comes together.